Hearings at 11:30am, Tuesday Jan 10 in Room 801, City Hall. Crime Numbers Keep Dropping Across the City - New York Times: "New York's continuing decline is in contrast to some other cities across the nation. After years of falling crime, Boston is now experiencing a surge in homicides." : Anthony Galluccio and Marjorie Decker told the Cambridge Chronicle this week that they are running for the state Senate seat being vacated by Jarrett Barrios, a candidate for Middlesex County District Attorney. The Middlesex, Suffolk and Essex district stretches into Allston, Brighton, Cambridge, Charlestown, Chelsea, Everett, Revere, Saugus and Somerville. BostonHerald.com: Is your car ready for a close-up? Officials say traffic cameras are needed: " In 1996, Boston tested red-light cameras at a Commonwealth Avenue corner, but the city couldn't get state legislation passed to allow them to use the cameras to ticket. State law stipulates that a police officer give a citation to the violator. " National and local stories about the safety of chemical plants in general and Houghton Chemical in Allston. It is hard to believe, but more than four years after the Sept. 11 attacks, Congress has still not acted to make chemical plants, one of the nation's greatest terrorist vulnerabilities, safer. If terrorists attacked a chemical plant, the death toll could be enormous. A single breached chlorine tank could, according to the Department of Homeland Security, lead to 17,500 deaths, 10,000 severe injuries and 100,000 hospitalizations. Many chemical plants have shockingly little security to defend against such attacks. Massachusetts public safety leaders should be taking a hard look at our emergency plan to see Houghton Chemical for what it is - a homemade bomb - that should be removed from the banks of the Charles River, the shadow of Fenway Park, and the midst of Boston. Overtime still key issue for adding pilot schools - The Boston Globe: "Both sides have quietly negotiated since the union blocked teachers' efforts to turn the Thomas Gardner Elementary School in Allston into a pilot school in June 2004, though the majority of teachers voted in favor of it." Big Dig costs may rise by millions - The Boston Globe: "One of the officials pegged the estimated increase at $75 million, an increase that Massachusetts taxpayers or tollpayers would have to absorb, because the federal government has capped its contribution to the controversial megaproject." This exhibit room is open to the public Monday-Friday. Click here for an online tour of the room. More information is at Harvard's Allston website. To schedule a guided tour, email allston@harvard.edu or call 617-495-3525. Why should I pay for this concrete sidewalk? Boston residents who want a concrete sidewalk in front of their house are charged $150 for the city to replace an asphalt sidewalk with concrete. Do you think improvements such as fixing sidewalks should cost extra, depending on where you live, or come as part of basic city services? In 1999 Boston stopped using racial quotas to assign students to its advanced work classes. Since then the % of black students in advanced classes has dropped from 49 to 25. Black and Hispanic students fill 44 percent of the 968 seats in the accelerated classes in the school district, though they make up more than three-quarters of Boston's students overall. NATIONALLY, more than 14,000 people are killed and one million injured each year in run-off road accidents. 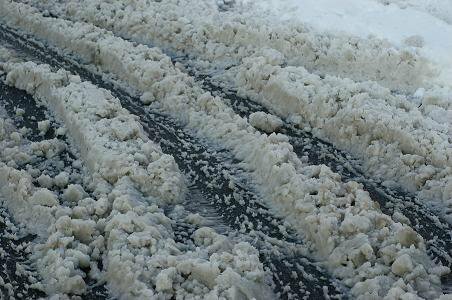 Allston residents have been warned by Turnpike officials about the dangers of snow plowed from the Pike's new breakdown lane onto Lincoln Street (''After storm, Pike faces complaints," City & Region, Dec. 13). The wood fence that the Turnpike built this year is not strong enough to block plowed snow -- sections of this fence came crashing down after this season's first snow. It should therefore be replaced with a wall able to protect us from both these dangers. The new wall should be tall enough to block plowed snow and strong enough to prevent a crash on the Turnpike from ending up in someone's front yard. My neighbors and I are not asking for a sound barrier to be built now. In 2004 the Turnpike spent $12 million to build a safe barrier between the eastbound and westbound lanes of traffic. We are only asking that Turnpike authorities be as serious about the safety of people who live near the road as it is about the safety of people who drive on it. The Harvard Cermaics Program at 219 Western Ave (at the intersection of North Harvard) is having their semi-annual sale through Sunday. A lot of different styles of ceramics at very reasonable prices. More Info. Preschool Holiday Storytime for children ages 2 to 5 at 10:30 a.m., Holiday Craft for Older Kids for children ages 6 and above at 1 p.m., and 3pm Movie: March of the Penguins. Overview of the Dec 5 presentation by the semi-finalist artists for this site. The proposals are on display at the Honan Library through the end of the month. Click here for more information about this project. Something that Allston certainly has too much of. You can contact the city's 24-Hour hotline at 617-635-4500 or use this form to get graffitti removed. Romney never was considered friendly to the major cities in the state. Boston would benefit from a new governor more willing to help our cities who meet many of the state's needs (like affordable housing). Mayor Thomas M. Menino yesterday appealed to business leaders to pressure lawmakers in his long fight with the State House over local taxes and other efforts to bring more money to Boston. Boston is facing an intensifying financial crunch in a climate of reduced state aid and escalating health and energy costs. Anyone else want to post? I'm happy to open up this soapbox to anyone else who would like to post instead of just comment on the posts I've made. I just need your email address. Give me a call if you are interested - 617-538-7038. We are not asking for a sound barrier to be built now. Every time the sound barrier issue comes up the Turnpike just tells us we have to wait because we are lower on their list. We don’t seem to be able to move up on their list and this issue becomes a conversation stopper. We want a safe wall tall enough to block snow. The Turnpike told us that without a safe wall to block snow we would not be safe. The wood fence is obviously not capable of blocking snow. Nationally, more than 14,000 people are killed and one million are injured each year in run-off road accidents. 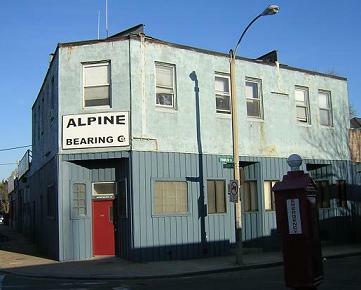 The residents of Allston have also been warned by Turnpike officials about the dangers of snow plowed from the Pike’s new breakdown lane onto Lincoln Street (“After storm, Pike faces complaints”, December 13). 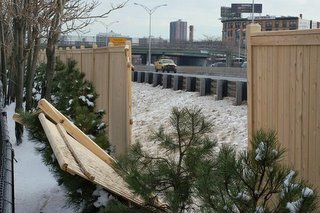 The wood fence that the Turnpike built this year is not strong enough to block plowed snow – sections of this fence came crashing down after this season’s first snow. It should therefore be replaced with a wall able to protect us from both these dangers. The new wall should be tall enough to block plowed snow and strong enough to prevent a crash on the Turnpike from ending up in someone’s front yard. My neighbors and I are not asking for a sound barrier to be built now. In 2004 the Turnpike spent $12,000,000 to build a safe barrier between the eastbound and westbound lanes of traffic. We are only asking the Turnpike be as serious about the safety of people who live near their road as it is about the safety of people who drive on it. Extensive safety enhancement project on Boston Extension - In 2004 the Turnpike built a 42" concrete median barrier between the eastbound and westbound traffic lanes. "These are vital safety improvements" said Turnpike Chairman Matt Amorello. What the Turnpike builds between Lincoln Street and the Turnpike should be at least as safe. What do we need between Lincoln St & the Pike to be safe? The stories below raise an interesting question about the safety of Lincoln Street. The Turnpike built the wood fence to protect Lincoln Street from plowed snow. 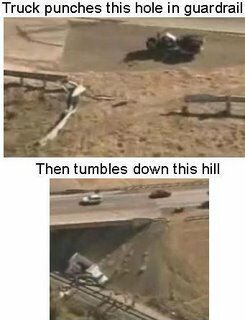 But what will happen if an 18-wheel tractor-trailer going westbound on the Pike has a serious accident? Will the guard rail between the new breakdown lane and Lincoln St. stop the truck? I'm not an expert, but I don't want to trust my life to the guardrail keeping the truck on the turnpike. Sturbridge, MA: A head-on crash began when a tractor-trailer crashed through the center guardrail on the Massachusetts Turnpike. Texas: Car & truck crash from bridge, through a guardrail, and tumble down an embankment. Illinois: A semi hauling two trailers crashed into a tollway maintenance vehicle. The truck then ran through a guardrail, rolled over, and caught fire. Mass Pike's $200,000 wall - what next? "It is part of the important safety improvements we're making on the Boston Extension, where we're introducing breakdown lanes to areas of the westbound side of the roadway that has never had them before," Turnpike Spokesman Doug Hanchett added. Without the screening fence heavy snow and ice from Turnpike plows would be thrown onto the sidewalk on Lincoln Street. The screening fence, which needs to be sufficiently sturdy to handle the force and weight of the snow, will prevent that from happening. Obviously what is now between Lincoln Street and the Pike is inadequate. We should not accept a patch job of 2x4s and nails on this inadequate fence. This fence needs to be taken down and immediately replaced with a properly engineered wall made of brick, concrete, or other durable materials and designed in collaboration with the community. Please let your State Rep and Turnpike Chairman Matt Amorello know that this is what should be done. The more people they hear from the more likely we are to have this corrected. When the Mass Pike was planning this wall along Lincoln Street they insisted that it would be a strong wall that would last decades. It is only a few months old and already falling down! If you don't like seeing this, call Turnpike Chairman Matt Amorello 617-248-2800 or send him an email. Our police captain certainly seems to be looking out for the interests of the Allston homeowner when it comes to rowdy student behavior. For years the abutters of NSTAR's Lincoln Street substation have been asking NSTAR to be a good neighbor. 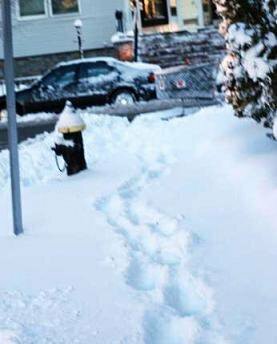 One way to do that is to shovel the snow off the sidewalk adjacent to their property. As you can see they haven't done that since yesterday's storm. NSTAR claims to be "committed to the communities it serves" so will it make a commitment to keep their sidewalks safe? 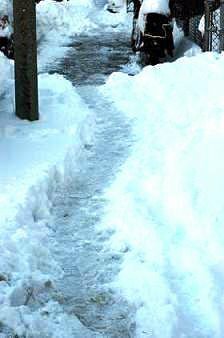 Some people in our neighborhood do a nice job shoveling their sidewalks. Others don't. 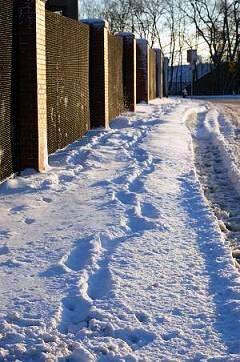 Boston's Storm Guide says "Sidewalks should be passable within three hours after a snowstorm." But what if they aren't? Do we want Boston to issue fines? What is the safety impact for people who are old, young, or disabled when they have to walk in the snow and ice on the sidewalk or dodge cars in the street? Plowing from yesterday's storm was somewhat uneven in our neighborhood. Here is the intersection of Mansfield and Allcott 18 hours after the storm ended. The average bill is 58 percent higher than it was in 2002 and the average single-family homeowner's tax bill will increase to $2,750. The Harvard Crimson :: Opinion :: Who's Got the 'View? More info at the City's website. In Allston our neighborhood emergency shelters are the Gardner and Jackson/Mann Schools. Lincoln Street Green Strip - Doormat to welcome mat? A great story in the Globe about this effort to improve the neighborhood and create a much needed green space of beauty. On Dec. 5 from 6-8 p.m., residents will meet the four teams of semifinalists at the Honan library who have been chosen to design the public art installation at the Lincoln Street strip. Nearly three months later than expected, Mayor Thomas M. Menino and the Boston School Committee named a 12-person superintendent search committee yesterday. Despite the delay, the committee still plans to name a superintendent by the end of the school year to replace Thomas W. Payzant, who will retire in June after leading Boston schools for more than a decade. ''As mayor, in my next term, this will probably be the most important thing I do," Menino said. Officials will require taxicab operators to place transponders in cabs so they can use the Fast Lanes in the tunnels and on the Massachusetts Turnpike. The requirement will take effect June 1. States to move on cutting emissions - The Boston Globe: "Seven Northeast states decided yesterday to move forward without Massachusetts on a landmark agreement to limit power plant emissions, because of the Romney administration's reluctance to act on the pact, according to two government officials involved in the negotiations." Boston showed the most improvement among a group of eleven large cities in federal math testing. Overall, Boston's scores were in the middle of the pack. What this means for your child at a specific school is not exactly clear. Tap water in 4,500 Boston properties flows through aging lead pipes that could be exposing city residents to higher lead levels than is allowed by federal law.Read the Boston Globe story. Is your house linked to city water lines with lead pipes? Find out here.